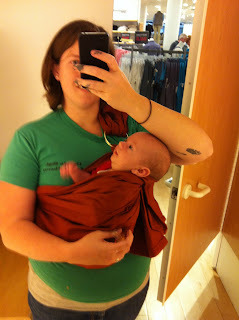 So...it seems that I have become a little obsessed with baby slings. I absolutely LOVE wearing my baby. 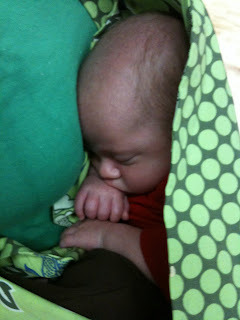 He is really content in the sling, and he gets a great view of his world (when he is awake). And, as an added bonus, I can use both hands to complete any task ahead of me. 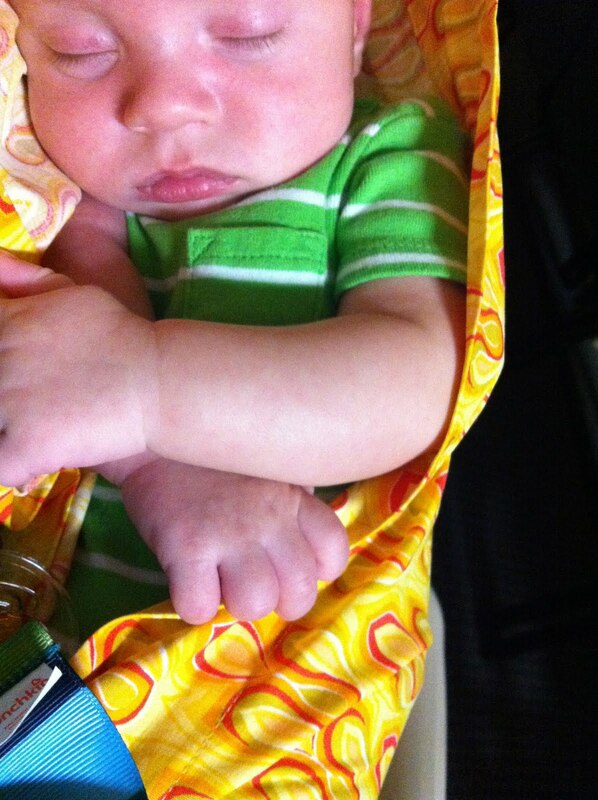 There is very little I cannot do with Jonah in a sling. I have painted sets for Raa's musical, cooked, taken long walks, peed, danced...you name it. In fact, I like it so much that I own five, that's right, FIVE different slings. 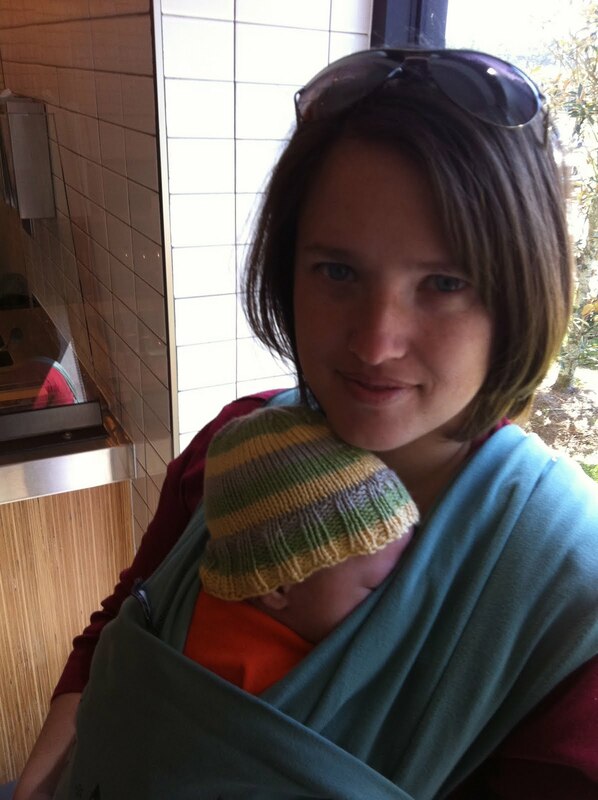 This is my Moby wrap. I used this constantly when Jonah was teeny tiny. It is perfect for newborns. 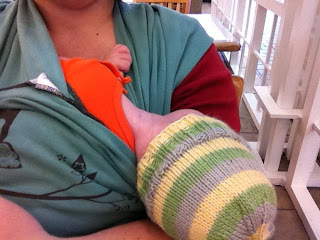 I also use it whenever I know he will be in the sling for a while. It is by far the most secure feeling choice, and it is the easiest on my back, since it crosses over both shoulders. This is how he prefers to sleep in it. This has earned me many comments from well-meaning individuals who assume that I have no idea what my son is doing. I try not to get too irritated. I know they mean well, and it is sweet that they are concerned for my son's well being. This is my Maya wrap. Actually, it is not really a Maya wrap. My darling friend Melissa made this for me. I love it. I like that I can adjust it in the front and back independently. I use this for running into the mall. Shortly after I took this picture, I tried on a pair of pants with him still in the sling. I have skills! Now that Jonah is bigger, he likes for me to sit him upright with his back against my chest. This way he can see what is going on around him. This is my jellybean wrap. I got it for $20 from target. This is the sling I use for messy activities. For example, this is where Jonah hung out while I was painting sets. The sling now has some paint spots, but it was perfect for this task! I have also nicknamed it the "sleep sling" because every time I put Jonah in it, he falls asleep! Very handy! Similar to this one is my sling I ordered from Seven. This one is perfect for the warmer weather because it is made of a light weight fabric. Clearly he loves to sleep in these things! The last sling I own is made of blue mesh similar to basketball shorts. It is for taking Jonah in the pool or the ocean. I cannot wait until it is warm enough to put that one to good use! Anyways, there is my obsession!